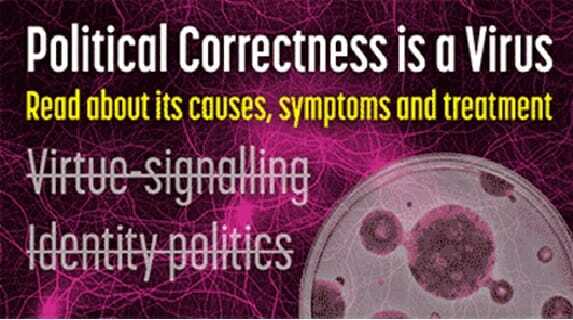 The causes, symptoms, prevention and treatment of cultural Marxism are spreading everywhere, in the EU and worldwide. In this research we look at the causes, symptoms and methods of prevention and treatment of ‘moralitis’, the societal virus that is causing political correctness and identity politics. The body politic has become infected. Like the growth of bacteria in a Petri dish, the subversive tenets of cultural Marxism have spread as a pinking of the public discourse. The loss of rationality from public discourse and reckless abandoning of evidence in favour of politically correct moralistic mantras damages the civitas. Diversity of ideas is strangely absent from the heterogeneity celebrated by the political and cultural establishment. Alongside the widely reported increase in food intolerances, society is suffering from ‘ideallergy’, an intolerance of other people’s ideas. This cultural virus is truly an epidemic. This manifests in a moral hegemony that subverts conventional social norms and quashes dissent. In this delusional condition, people may seem to be acting with autonomy, but the forces of conformity are such that their freedom is limited, and their utterances merely regurgitate group-think. The process by which this has occurred is analogous to a virus. It is an epidemic disease so powerful that it has a cytopathic effect on society, changing the cognition and behaviour of its hosts. We need to consider the psychological and sociological perspectives on social and political attitudes. The causes, symptoms and prognosis can be described, followed by methods of prevention and treatment. It is part of this cycle. Robert Oulds and Dr Niall McCrae discuss their research Moralitis: A Cultural Virus that explores the causes of political correctness.